The article is a translation of “Les carnets de recherche en ligne, espace d’une conversation scientifique décentrée” in Lieux de savoir 2. Les mains de l’intellect, ed. 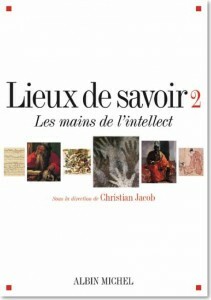 by Christian Jacob, Paris, Albin Michel, 2011, 992 pages. However, even if today the main mode of distribution for academic journals is by Internet, we might well believe the same applies to all documentation used in writing articles. Researchers’ data—notebooks, fieldwork, and procedural records—is often entered into a digital support, so with the technical means at our disposal today, it could fairly easily be distributed online. Such records may also come into contact with a recently-evolved and unique type of publication, used by increasing numbers outside the academic environment: the online log, or weblog, or blog . Blogs are effectively a short series of notes classified in chronological order giving their authors the possibility of creating a dialogue with their readers via comments. The blog phenomenon on the Internet has exploded and it has not escaped the attention of a section of the academic community who have adopted this form of communication as a way of lifting the lid on the way their laboratories function. Academic blogs create a conjunction between traditional academic writing practices and a mode of publication born on the web , and for several years academic blogs have been springing up everywhere. The conjunction between the two forms does not imply fusion. Careful observation of academic blogs shows that they do not render laboratory notes word for word. When research notes are made public, they are immediately transformed, producing new types of document, all of which creates a new mode of academic communication. Antoine Blanchard applied the famous “research compass card” method proposed by Larédo and Callon, and revealed  the flexibility of the academic blog in all research fields: in the production of ratified specialist knowledge, in training and innovation, and in making research relevant to the community at large through simplification. We are a far cry from online procedural records; the academic blog should rather be defined as a multi-use communication tool for use by researchers in all the many different dimensions of their work. The blog therefore constitutes a good way to create a broader vision of academic writing practices in all their diversity, a vision that cannot be reduced to the clearly demarcated research article that is published in a reading committee journal. While sociologists of science endeavour to slip behind the neutral tones of the academic article and lift the lid on laboratory life, recording the life and passions of the everyday academic, in many respects the academic blog emerges as another locus from which to observe the reality of research. What is striking is the great diversity of information that researchers publish on their blogs. Blogs are a sort of researchers’ bazaar, a real-time showroom of their professional production that is not just limited to the laboratory or library. Academic blogs less relate accounts of experiments and relay instead a whole of information about experiments and research, and their related activities—seminar or conference papers, research policy, the encounter with the academic world at large, meetings, debates and discussions. This is the case, in particular, of the most popular and most widely read blogs. Academic blogs are picked up by the Wikio research engine and those most frequented are often those dealing with the environment or astronomy. Cosmic Variance is one of the best known . The blog is written by a group of seven physicians and contains posts on subjects as diverse as the launch of a universe exploration probe, the discovery of new stars, an account of a series of conferences on gravitational waves, or of science made simple for a broader readership. Real Climate meanwhile is a blog run by four American and Norwegian climatologists. Here again the blog essentially posts articles about the latest news, publications, reports, and debates in the field of climatology and climate change. A quantum diaries survivor is the blog of Tommaso Dorigo, a physician working for the CERN. He posts comments on articles on the open Arxiv archive, but also seminar presentations, and various stances on different events relating to his community. The phenomenon can be analysed in practically the same terms in the humanities and social sciences. Archives de la Recherche en Histoire Visuelle, for example, is a blog run by André Gunthert, a photography historian at the EHESS. In his online notebook, there are announcements for publications and conferences, as well as comments about politics today, theoretical propositions or reflections on academic policy. 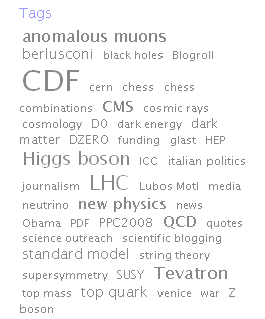 The diversity of themes that characterises most academic blogs, and the documentary disorder that disconcerts the reader who is more used to the more regimented forms of traditional academic publications, is the distinctive feature of the online weblog, organised on the sole principle of chronological succession. Unlike a research log written on a paper support, the blog benefits from the flexibility of electronic publication methods and in particular from the advantages of hypertext links. All blogs are therefore equipped with a system for describing their content through categories or keywords, which enable access to a classification of posts by theme, independent to the chronological order in which they were posted. In this way each post is often described by one or several “tags” which means that it can be related to other posts on the same subject. This is a cataloguing system that academic journals have long used. The uses of the same documentary tool are however very different in both cases. In the case of journals, and by extension open archives, the taxonomic systems that enable to attribute a subject to an article are relatively standardised, at least within a specific academic community. These systems reflect the structuring of a discipline or of a research domain. The keywords used in blogs are very different. Keywords are often improvised by the author as he or she is writing the post and there is often no underlying standardised system. They are instead a simple reflection of the slightly chaotic diversity of everyday life. The main concern is not rationalisation but rather to categorise each event by theme so as to be able to find it again later. It is at this level that the researcher’s blog resembles a notebook through which he is able to amass information, remarks, and fleeting thoughts at the moment they arrive, with the possibility of finding them again subsequently via keywords that are appended freely for each entry. 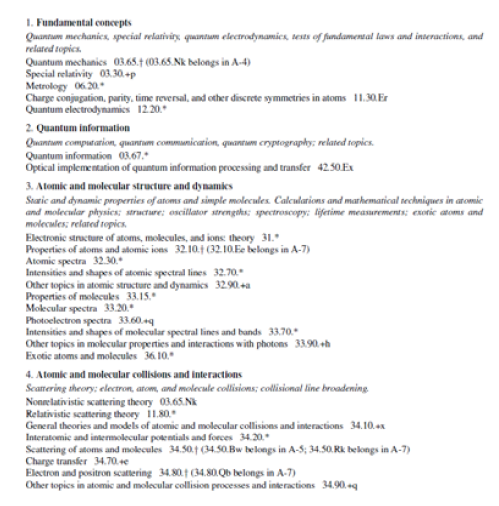 We might compare this list with the list of categories that the reference journal of particle physics, Physical Review A, uses to classify the articles it publishes. In the former case we see a structure-less jumble of references with very different levels of generality, combined with elements that are radically foreign to scientific research. This kind of categorisation corresponds to what the computer scientist, Thomas Vander Wal, has called “folksonomy” , that is to say a categorisation of unconstrained and uncontrolled content. In the latter case we see an ordered taxonomy, systematically covering the full scope of research in physical sciences. This opposition between the jumble of the researchers’ blog compared to the cathedral-like structure of the academic journal highlights the liberating character for the researcher of the research notebooks in relation to classic publications . Whereas classic publications impose standards of expression, editorial standards, publication deadlines, and also strict academic validation frameworks, the blog enables researchers to free themselves of all these constraints within the context of the blog. The various articles posted by the researcher, however, do reveal the researcher’s intellectual journey. In history and sociology, in particle physics as in genetic biology, researchers’ academic activity is not only directed by its own logic. It is intensely directed by current developments, events relating to his or her discipline or academic environment of course, but also in relation with the preoccupations that affect the society in which he or she lives. This is above all what academic blogs reveal when the lid is lifted on laboratory activity. Contrary to the popular image of the absent-minded boffin who is indifferent to the world around him, research blogs instead show something very different: an open academic practice grappling with the academic, intellectual and political debates of its time. From this point of view, the development of academic blogs has had a tendency to radically redefine the relationship between science and society. The most obvious phenomenon is that of disintermediation. The communication model is not exclusively that of the translation of scholarly artefacts by this “third man”, the academic journalist, who writes for his profane audience. Through the blog, the researcher talks directly to an audience that is no longer segmented. The flexibility of the blog and its varied character enables it to bring together different readerships in the same publication space—the website. Posts relating to a variety of subjects written in different ways and so address mixed types of reader or, more to the point, imply no prejudice about the quality or the expertise of those reading them. There is a clear opposition with more traditional forms of publication here. The opposition between research journals written and read by researchers with their strong segregation, on one side, and reviews written by journalists and read by the public at large, on the other, does not necessarily apply to the world of blogs. There is considerable editorial interference in blogs because they address themselves to all readerships at the same time, and also because they break down the barriers between professional roles. The profiles of science blog writers include researchers and also science journalists, science fans, teachers, and decision makers in science policy. Many have hybrid profiles, like Phil Plait, the man behind the blog, Bad Astronomy, who is described as “an astronomer, lecturer, and author. After ten years working on Hubble Space Telescope and six more working on astronomy education, he struck out on his own as a writer. He has written two books, dozens of magazine articles, and 12 bazillion blog articles. He is a sceptic, and fights misuses of science as well as praising the wonder of real science.” This career path may seem unorthodox but it is fairly representative of science blogs. This type of presentation is significant in that it shows the reputation issues at stake in academic blogs. Here again, this type of communication upsets the classic models that describe an ideal situation where the legitimacy of a researcher or research comes exclusively and initially from peer acknowledgement, and is subsequently confirmed by a form of popularity accorded by society on the basis of this academic excellence. Several studies of science from historical and sociological perspectives have highlighted the entrepreneurial dimension of academic research  where the talents for communication possessed by the major academic figures have played an essential role in their capacity to mobilise the means necessary to conduct their research, from public or industrial sources or other sponsors. The success of researchers’ careers and also the theories that they put forward depend largely on their capacity to convince and communicate outside the academic sphere and respond to a form of social demand. This also gives researchers several trump cards, on several levels, which enhance their recognition by the academic community. The process could therefore be described as a game of reciprocal conversion between different forms of credit where academic credit plays an important but not exclusive role. Through its flexibility and its capacity to attract a wide range of readers, and through its own distinctive properties as a social medium , the blog seems to be a fairly efficient conversion instrument. It is also a reputed construction tool within networks and also fulfils this function when used in the academic sphere. Through its enunciative structure it enables researchers to express themselves from unusual and subjective perspectives, which are unacceptable according to the standards of academic publications. Thus it enables an individual researcher or group of researchers to mark out a territory of expertise in relation to their peers as well as in the public sphere. In his conference paper on what blogging has brought science, Antoine Blanchard cites several examples of bloggers whose posts have been picked up within their discipline and who have subsequently been requested to produce genuine publications . A number of other cases may also be mentioned among them, that of Jean Véronis, a computer linguistics specialist at the Université de Provence who opened his notebook, Aixtal, in 2004 . The notebook was initially aimed at his own students but gradually he made his discipline popular by taking an interest in the search engine, Google, which helped him reach out to a less specialised readership. But it was above al by applying the methods of analysis of his discipline to the discourse of politicians that Jean Véronis became more famous. He has since published several works on the subject and the media regularly appeals to his expertise to decipher politicians’ speeches or social debates. His expertise is also recognised in the industrial sector where he intervenes as a consultant. This type of example shows us how the blog has become a form of ego-reference: a communication platform for multiple targets through whom researchers can feed their academic profile. This initial overview of the world of academic blogs leads the observer into unexpected territory. The hope that raw research data—field work and lab notes—would be made openly available has proved to be illusory and untimely. In any case it is not in the form of online research notebooks that is likely to take place. Outside established databases that collect measurements and standardised information, there exist a small number of experiments into what is sometimes called open notebook science. The Useful Chemistry  initiative in particular encourages chemistry researchers to publish the accounts of experiments they carry out. It should be stated however that the technology and the type of web publication used is not the blog. The online research notebook does not mean transference of field or laboratory work online, even though they are both organised by chronology. Neither is it a publication support in the way that peer-review journals or books are, and it is no replacement. The online research notebook lies somewhere between the two. It is sometimes full, in the best cases, of working hypotheses, which will later give rise to publications. Most of the time, it tells of the monitoring role that researchers carry out in their own disciplines, and on their own research subjects. But above all the online research notebook constitutes an interface between its writer and its environment, in all its diversity and complexity. It possesses a fundamental social dimension that governs and defines both the way it functions and the functions it fulfils. However this dimension appears in a totally unexpected way in the course of analysis. And firstly it seems not to have been anticipated in the multiple reflections carried out on how the effects of digital media have transformed academic writing. “A blog is a type of website, usually maintained by an individual with regular entries of commentary, descriptions of events, or other material such as graphics or video. Entries are commonly displayed in reverse-chronological order. “Blog” can also be used as a verb, meaning to maintain or add content to a blog. Many blogs provide commentary or news on a particular subject; others function as more personal online diaries. A typical blog combines text, images, and links to other blogs, Web pages, and other media related to its topic. The ability for readers to leave comments in an interactive format is an important part of many blogs”. WIKIPEDIA 2009, article “blogs”. Marin Dacos is the Director of the Centre for Open Electronic Publishing (Cléo). He is the founder of Revues.org, Calenda, the social sciences calendar, Hypothèses, a research blog platform, and Lodel, an electronic publishing interface. Originally a historian of photography, he taught at Avignon University and the EHESS in Paris for several years before founding Revues.org in 1999. He is now a digital humanities specialist and an “information system manager” for the CNRS (National Centre for Scientific Research). He has published a great many articles on digital history and digital publishing and is the editor of Read/Write Book. Le livre inscriptible (Prunel, 2009) and the co-author, with Pierre Mounier, of L’édition électronique (La Découverte, 2010). Pierre Mounier lectures in the “Digital Humanities” at the École des Hautes Études en Sciences Humaines et Sociales (EHESS) and is the director of the research blog platform Hypotheses.org. He is the editor-in-chief and author of Homo Numericus, a blog focused on digital technologies. He was the Head of the digital publishing service of the humanities department of École Normale Supérieure (2002-2008). A graduate of the École Normale Supérieure, he has a master’s degree in social anthropology (Université Paris X Nanterre) and a teaching certificate in French literature (Université Paris Sorbonne, Paris IV). English translation by Jonathan Sly. The second part of the article has been published on this blog .